Within seconds, the whole office burst into the sound of hundreds of people excited to be let out early on a Friday afternoon. 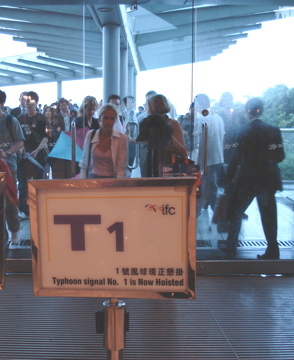 Since this was my first typhoon, I wasn’t sure if to take a taxi or try to get onto the train. But since my hotel is not far away, I figured I would take my chances with the public transport so at least I would know what it is like for when the next typhoon comes along. What a mistake this was! Outside Central station umbrellas were bending and flying in the wind, but there was only some light rain. Didn’t seem like such a big deal, to be quite honest. But when I went downstairs to the train, talk about panic at the disco! I was confronted by a massive mob of commuters, all angry, pushing, and sweating, not able to move anywhere. The whole place was absolute bacchanal! And not a SINGLE station master in sight to try to control the crowd or lead people in the right direction. It was every man for himself. When I finally squeezed myself into the train it wasn’t much better, and people outside were irate they couldn’t get inside the arriving trains. Obviously these HKers don’t know how to maximise space the way Tokyoites do. The ladies in the train started shouting and shrieking when people tried to push their way in, but honestly I have seen it much worse in Tokyo. Tokyo people deal with this kind of insane overcrowding every day, and know how to take a deep breath, tuck their arms against their bodies, stay calm and bear it. I don’t know why these Honkeys were freaking out so much! On the evening news they even showed a few women in the station breaking down into tears and being escorted out by some kind of security person. Weak! So, I guess I am stuck in the hotel tonight, because I’m certainly not getting back on those trains to go anywhere. I’ve got a 6-pack of beer and some foodies, which is all that I need. Hi! I stumbled across your Tokyo blog…somehow. Can’t remember now. Now I’ve followed you to Hong Kong. My job requires a lot of interaction with people moving to/from Hong Kong (and pretty much everywhere else in Asia) so I’ve really been enjoying hearing about your experiences so far.